Personal confession: I own a small battery-powered radio set. Just in case of a big disaster, you know. You never know when an atomic bomb is going to hit London and cause delays on the Tube. Angry at this radio monopoly during the end of the world, Twitter created a new feature 'intended for crisis, disaster and emergency communications': Twitter Alerts. 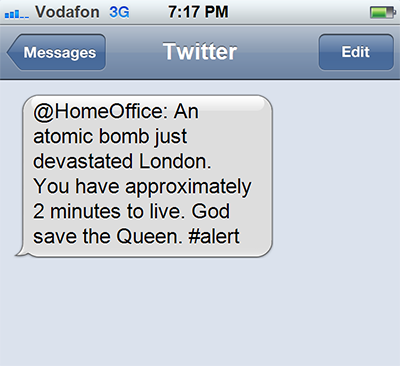 First released in the US, Japan and Korea, Twitter Alerts are now working in the UK, as the UK police forces, the London Fire Brigade, the Mayor of London’s office, the Foreign Office, CEOP and the Environment Agency just signed up for the programme. Basically, in a moment of crisis or disaster of some importance, the security bodies which signed up to this service service will jump on their keyboard to broadcast Alerts. If you are lucky enough to be still alive and have the reflex to take your smartphone out of your pocket, you will receive SMS and tweets marked with a small orange bell. Given that you subscribed to the alerts... and that phone networks are still available. Radio will, of course, still broadcast special bulletins, and amateur radios will take the relay if the big cities are in a blackout (this is actually an interesting subject worth reading about). The bad news is, even during the apocalypse, we will still need an iPhone charger.